1. Learn to love your browser’s Find feature. Need to scan a science article for norepinephrine references? Want to find the sole quinoa dish in a list of 50 or 75 recipes? Hit Control + F or your browser’s Find button to search for terms. Using Find doesn’t mean you won’t need to read more for context, but it does speed up the scanning process so you can hone in on the needed info faster. 2. Block similar topics together. Some freelance writers work in a niche. Others write across a variety of topics. No matter which particular animal you are, one way to streamline is to group similar topics together during research, when possible. 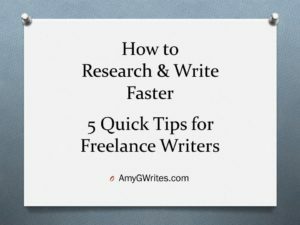 If the freelancing gods are good, you may be able to use the same resources for those articles…or you might find that researching one article provides insight into writing the blog entry or article for the similar topic. 3. Tackle ugly topics first. Procrastination won’t make a toughie go away—and it can make the task take longer because you boost the risk of last-minute snags that lead to flurried hassles, like fumbling through jargon you don’t yet understand or scrambling to find proper sources. Save time (and sanity) by placing tricky or unfamiliar content high on the to-do list. Seriously. Research shows that taking regular breaks makes workers more productive and–this is a biggie, fellow writers–more creative. Find a regular work-break schedule that makes sense to you. I tap online timer e.ggtimer.com to use the Pomodoro productivity method—work intervals of 25 minutes followed by 5 minute breaks (h/t Jennifer Mattern who shared this technique on All Indie Writers). Try it out, or check out the many other apps available to keep yourself awesomely productive. 5. Go for a two-fer. Monitors, that is. Stop flipping back and forth between a research tab and draft document. Stop squinting at squished-up windows on your single screen. Consider investing in a second computer monitor. When they’re placed side by side, you can use one for researching, the other for writing. I went dual-monitor about 3 years ago and it was a serious productivity boost. Don’t ever try to take away my second screen. Ever. I *will* go bad-fairy Maleficent…and smote you. What quick productivity hacks do you use while writing or researching content?